I like your squishy bear. But I feel a bit sad for him, as he has no arms and legs yet. That is really cute. I wish I had a squishy bear. I do have a squishy that I cuddle everyday. Fra-gee-lay! It's like you're in my head. Awesome? or scary? You decide! 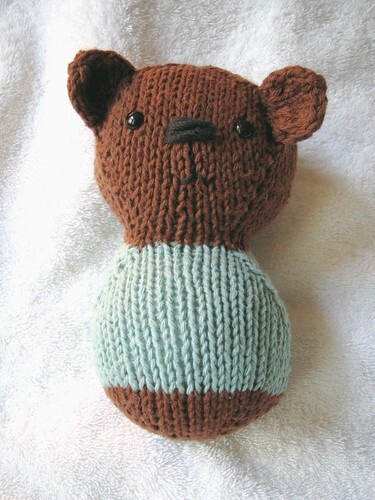 Your new squishins is teh r4d, and I hope some quality cuddlesnooze time does you good. It certainly can't hurt. And yes, I know I owe you like 14 emails. It's not for lack of wantin' to! Aww, that squishy bear is just perfect. No arms or legs needed. Awww, he's so cute. Just the thing to make you feel better! You did good by making your squishy bear. Sometimes we all need a good cry or sometimes our bodies tell us we need a good cry--or two. :) I know I've been there. Hope you feel better soon.